Teaching and learning STEM subjects is more accessible than ever before! Children will be inspired, delighted, and challenged as they use everyday materials and STEM concepts to design and build solutions to problems faced by characters in their favorite books. 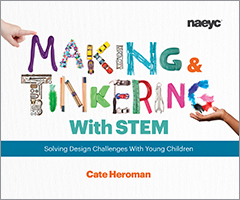 This practical, hands-on resource includes 25 engineering design challenges, suggestions for creating a makerspace environment where children can tinker with materials, use tools to make creations, and improve on their ideas, a list of 100 picture books that encourage STEM-rich exploration and learning, and a planning template so you can create your own design challenges.